In the eighty reviews I have posted to this website, I have read and reviewed only one book that has garnered major pop culture attention, The Book Thief by Markus Zusak. For some unknown reason, I have not gravitated towards those kind of books. However, I received an email advertisement from Amazon for Station Eleven recently, and I did not hesitate to buy this novel for my Kindle Paperwhite. Because of this purchase, it augmented my theory that some books you seek out to be read. While some other books will reciprocate the favor and seek you out to be read. On the surface, Station Eleven by Emily St. John Mandel is a post-apocalyptic novel revolving around a woman named Kirsten Raymonde who witnessed the death of Arthur Leander, a famous Hollywood actor, who had heart attack while performing in a stage production of King Lear. Also, a flu pandemic arrives into the city on that same night throwing the world she knew into utter chaos. Kirsten joins a small group of actors and musicians called the Traveling Symphony. They are determined to keep art alive as the world disintegrates around them. However, there is a prophet that believes he’s chosen by God to create a new heaven and new earth as stated in the Book of Revelation from the New Testament. The prophet’s presence threatens the survival of the Traveling Symphony and the final clash between them was chilling to read. Even though, the surface aspects of Station Eleven makes it akin many other post apocalyptic novels. But, the genteel tone and enigmatic distance of Mandel’s story adds an entire new dimension to this subgenre. The last post apocalyptic novel I read was Octavia Butler’s Parable of the Sower and tone of that book was direct and brutal. Station Eleven comes at this subgenre from an opposite perspective. It seems that Mandel was not so interested in the effect of what happens in a post apocalyptic society. But, how an individual reacts to that kind of society around them. 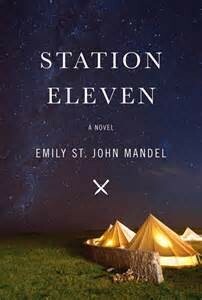 I found this viewpoint quite compelling and Mandel’s readable, efficient prose made Station Eleven an excellent page-turning read. I will admit I did not love this novel. However, I did like it quite a bit and will recommended the novel as one of my favorite reads of the year (even though it’s only March). I can see why this book has received so much pop culture attention. Well deserved and a must for book clubs.